The Woods of Edenderry is comprised of 101 spacious homesites on 77 acres with 16 acres of protected woodlands and wetlands built by Cervi Homes. The gently rolling terrain was carefully developed to include scenic walkout-level and private cul-de-sac sites. In addition, the subdivision was designed to complement Northville area’s Victorian charm, and includes winding sidewalks and old-fashioned street lamps. This was one of the first communities in the area of this scale that featured high-end homes in the million-dollar price range, and due to its high demand and success, several other communities followed. 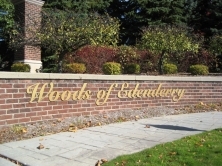 CLICK HERE TO DOWNLOAD A COPY OF WOODS OF EDENDERRY'S SUBDIVISION BYLAWS! Woods of Edenderry has approximately 109 homes in it. The homes range from 2800 - 7100 square ft. Situated in a private and wooded location, yet, still within walking distance to Northville High School and the scenic trails of Millenium Park and Hines Drive. The Woods of Edenderry are located within minutes of M-14, 96, US-23 and 275.